Method – How to make the dumplings: Mix besan, salt, turmeric powder, Kashmiri chilli powder and asafoetida together in a bowl. Add water little by little to make firm dough (Figure 1). Add gingelly oil and kneed well. Divide the dough into two portions and shape them to cylinders as shown in Figure 2. Using a kitchen knife cut them into thin slices. Keep aside. 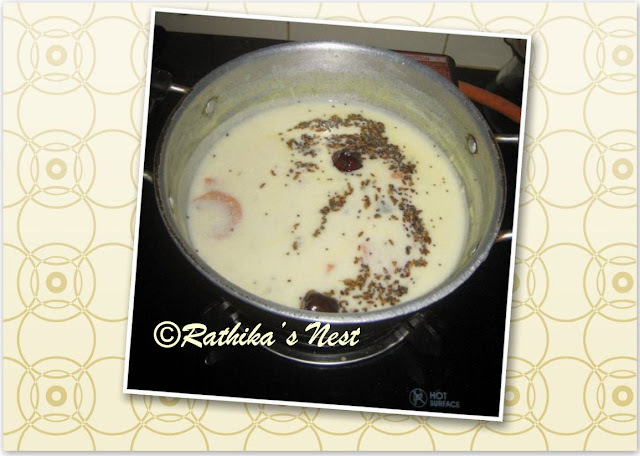 How to make kadhi: Grind green chillies and ginger into a fine paste and keep aside. Beat the curds well. Add besan, spice paste and salt, and blend together. Add jaggery or sugar and 3 teacups of water; mix well and heat on medium flame stirring occasionally. Once the khadi boils, simmer for two minutes (Figure 3). Now add the dumpling slices into the kadhi one by one, maximum 3 to 5 at a time. Once cooked, the dumplings rise to the surface of the kadhi. Repeat the process with the remaining slices. Once all the dumplings are added to the kadhi, simmer for a minute, and then remove from the fire. Heat oil in a tadka pan; add red chillies and when they turn darker in color, add mustard and cumin seeds. Once they start to sputter switch off the stove. Add the seasoning to the kadi (Figure 4). Garnish with curry leaves and coriander leaves. Serve hot with rice or chappati and a subzi.